We had dinner guests planned for a Sunday afternoon a couple of months ago and I needed a make ahead meal. Chicken pot pie wouldn’t normally fall into that category but I’m pleased that I came up with a version that my whole family loved! I even liked it and I’ve never been a huge chicken pot pie fan. This would be a great meal for holiday gatherings or when you are planning to have house guests as you can do all the prep in advance. Two Days Ahead: I cooked up a bunch of chicken leg quarters in my crockpot overnight so that I would have plenty of good meat and broth. The Day before: I deboned my chicken and strained my broth. Then I assembled my veggies – garlic, onions, celery, carrots, potatoes, corn and peas. I prepared the filling by sautéing the onions and celery in olive oil with salt and pepper. Then I added 4-5 minced cloves of garlic along with the carrots and potatoes. After those had sautéed for a few minutes I sprinkled on about 2-3 tbls of flour and stirred until the vegetable mix was coated and all the flour was absorbed. Then I poured my chicken broth over the mix and added 3 cups of heavy cream. I let it simmer for a few minutes until the sauce began to thicken. Then I turned off the heat and let it cool. The veggies don’t need to be cooked all the way through at this point as it will finish cooking the day of. Once cooled I poured it all in my big crockpot and stirred in my shredded chicken meat. Then it went in the fridge overnight. Next I prepared the crust. I used a recipe for freezer biscuits that I modified to use as a pie crust topping instead. Mix 6 cups of flour, 2 tbls baking soda, 1 tsp salt, 1 tbls sugar and stir in 4 cups of heavy cream. Let the dough rest for about 10 minutes after you’ve mixed it together. Then divide it in thirds and pat it out into three rough 10-inch circles about 1/2 inch thick. 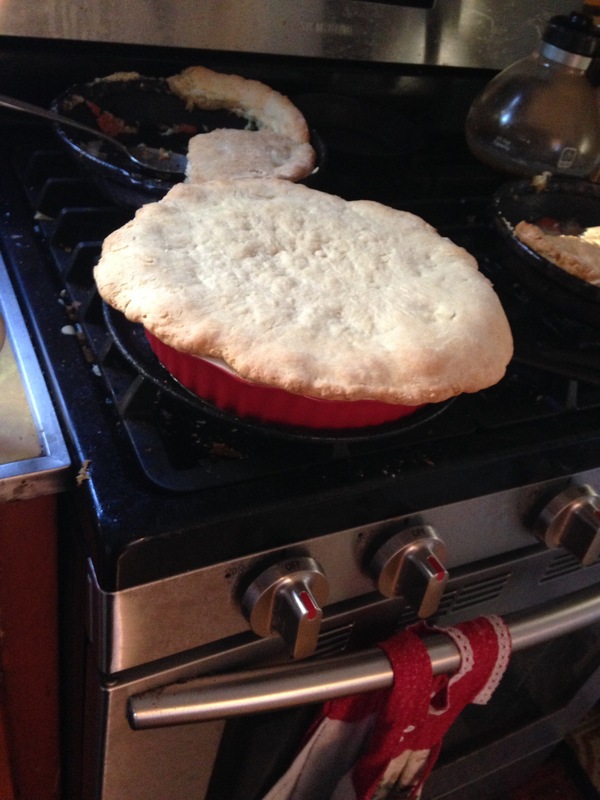 Be sure that the circles are big enough to go over the edges of your pie plate. Lay the dough out on cookie sheets and cover with wax paper or greased plastic wrap and freeze overnight. The Day of: Pull the crock pot out of the fridge and set it to cook on high for about four hours. The veggies will finish cooking and then you’ll only need about 20 more minutes in the oven to cook the dough. About a half our before you want to eat, fill your pie pans about 2/3 full with your hot, steamy filling from your crockpot. Add your frozen dough topper and cook each pie separately on 400 for 20 minutes. It’s not a bad idea to put a jelly roll pan under your pie plate just in case you accidentally overfill the pie plate and the sauce spills over like mine did. Your chicken out pie should cook up beautiful and tasty. Now eat up and enjoy your guests! Your work is done. This entry was posted in Cooking, Crock Pot Cooking, Food, Holidays, Recipes. Bookmark the permalink.